If you know me at all, you can’t be surprised that I think these are very cool tools! The Kindle (first and second generation) not only works, it it beautiful to look at and quite nice to hold. The more I travel, the more I think that being able to load a whole pile of books onto a small but easily viewable device like this is a good thing. Add the ability to also load dozens of magazine/newspaper publications and it’s nearly irresistible. The fact that this loading is done over a G3 network at no fee beyond the purchase of the publication is brilliant. I found out a few months ago that you can also upload PDF files to this device (for now, through a website — but soon they will be directly loadable if I understand correctly) makes the deal is so sweet I need a cup of coffee with it. So, when the 2.0 version was introduced by Amazon.com and the price began to do as prices of technology are supposed to do, what kept me from clicking on the Add to Shopping Cart button and calling it mine? When I travel and take a new book or two with me (usually fiction), I sometimes bring those books home in my suitcase — but I often pass them on to someone else who either also travels or who lives where English books are not so readily available as they are where I live. You can’t share books purchased on the Kindle unless you also share the device. I know that may seem incidental — and ultimately it might be less of a reason than it has been for me so far. But, sharing books is one of the things I love about books. Libraries are built on the value of sharing books and now also include sharing other things. I love that. Then yesterday Eric Twittered about this article on slate.com in which Farhad Manjoo suggests that the technology which lets Amazon.com delete an e.book from the Kindle owned by anyone “on network” whenever they want to paves the way for book-banning like we’ve never experienced. This article is fascinating if you are at all willing to consider any sort of conspiracy theory. I have friends who have these and love them — friends who are not as easily lured into the latest gadgetry as I am. 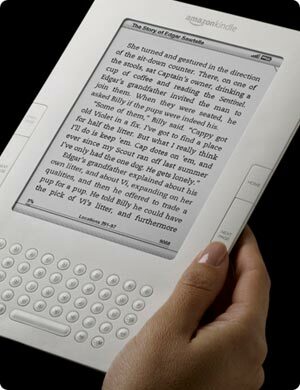 Will I take the Kindle plunge one of these days? Perhaps. The jury is still out, I guess. Cootie Trades "Camp" for "Spa"